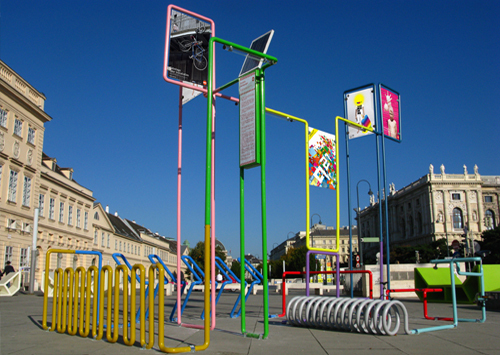 MN*LS has designed a bike parking station for MuseumsQuartier Wien that includes different types of bike parking systems combined together achieving a sculptural composition. The station includes a solar panel that provide energy to the LED lamps that illuminates the whole station at nights. Apart from that, it also includes a tire pump, a static bike with dynamo to produce light while exercising or playing. It also includes information panels for communication. This bike station was designed to be integrated in the MuseumsQuartier public space with the objective of making an element that would fit between the sculptural installation, and the functional element.